What a fabulous transformation. The image looks so professional - like an expensive designer print. Brilliant project. Ooohhh... you've been having fun!! Lovely! What a great concept!!! Love the look! I love that you are always letting us know about such new and different stuff - thanks!! 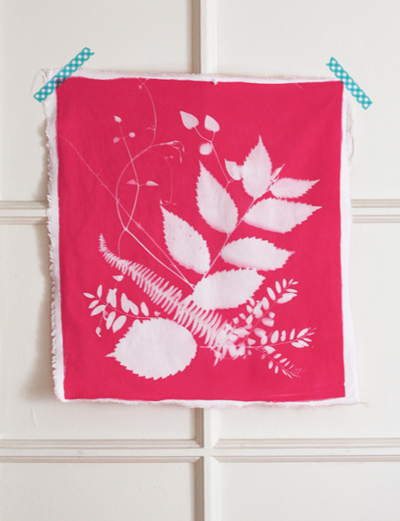 Inspired by your projects, I picked up some inkodye and have been experimenting with fabric printing. You manage to get such an even tone with your paint. I've found that I end up with a lot of streaks. Any tips? Yeah, I haven't had streaking problems. Hmm. I use a foam brush and make sure the fabric has plenty of dye soaked into it. I press the spongy brush down to sort of work the dye into spots that look dry or uneven. I take my time with this so I can see if there are any areas that don't look wet. I've only ever tried dying 100% cotton fabric. Possibly blends or synthetics won't take the dye as well. I make sure the fabric exposed to the sun is perfectly flat with no wrinkles, since wrinkles can result in cast shadows. i wonder if someone has possibly already covered this in another post, but could you use a heavy plexiglass over the items to press them down more while in the sun, or does this affect the sensitivity of the dye? You can! The risk is that condensation will form on the underside of the glass in the hot sun, and those water spots will make white marks on your fabric. So if you plan to use glass, be sure to blot up as much excess dye as you can from the fabric before exposing it to the sun. It can feel almost dry, and it will still change color. The less wet it is, the less likely you'll get condensation. Also note that some kinds of glass are treated to filter out UV rays, so your exposure time might need to be longer. 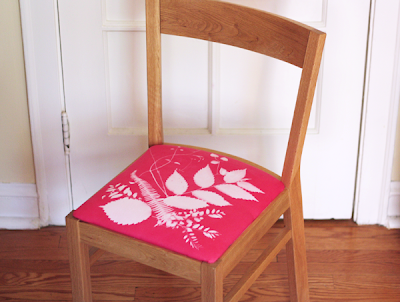 I love this idea, and especially using it to transform a chair. thanks for the inspiration!